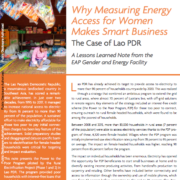 This note presents the Power to the Poor Program piloted by the Rural Electri cation Project (Phase 1 and 2) in Lao PDR. The program provided poor households with interest-free loans that enabled them to obtain a connection to the grid and wire their dwellings. House- holds headed by women were a focus of the program.